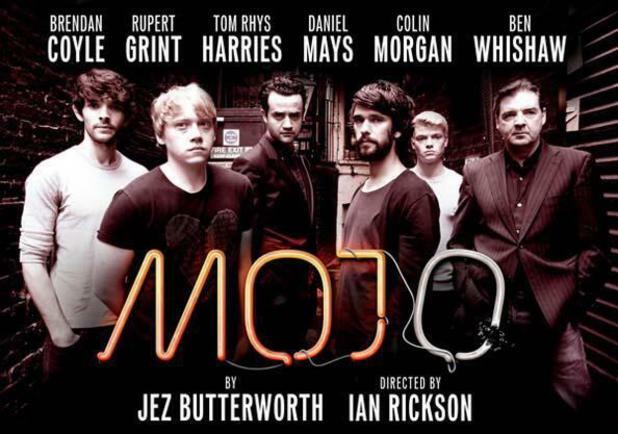 It is 18 years since Mojo made its debut at the Royal Court, and saw a 25-year old Jez Butterworth walking off clutching Olivier and Evening Standard awards and being hailed as an important new voice in British theatre. In 2013, four years after the brilliant Jerusalem cemented Butterworth’s reputation as a playwright of rare talent – one of the small band of writers who have left behind a play that will long outlive them – his early triumph has been revived for the West End. It is tempting to try and unpick the threads that brought Butterworth from Mojo to Jerusalem, to peer into the murky past and find the path that links then to now. However watching this starry, TV-friendly revival at the Harold Pinter Theatre, one is more struck by how there is little in the play that suggests a playwright of such talent that they would eventually produce a modern tragedy on a parallel with King Lear and The Cherry Orchard. There is no doubting the quality of writing on display in Mojo. If somewhat unadventurous in scope, it is sparky and genuinely funny. Butterworth’s writes high farce that crackles with a tension that hints at an underlying danger; the best of which often revolve around Ben Whishaw’s live-wire Baby. Baby’s recurring ‘Kiss my pegs’ motif is the play’s standout moment and in these scenes it feels that Butterworth is channelling the shifting energy that make Pinter’s early plays seem preternaturally alive. However there is no doubting the figure that looms largest in the background of Mojo; David Mamet. There are points when it seems that Butterworth has actually set himself on a mission to create an anglicised Glengarry Glen Ross. Mojo is a play that has far more in common with Mamet’s 1984 Pulitzer-prize winning play than with the emerging voices of the new wave of British playwriting in the early 1990s. The set-up seems to be a deliberate homage to Mamet’s original play, with the entire piece being set in two locations. The first half is set in a cramped office room above a club, reflecting and intensifying the underlying tension; the cast trapped and prowling like caged animals, their arguments bouncing off the walls and creating a claustrophobic atmosphere of distrust and fear. The second half replaces this with the main club; a far more expansive set that seems to disappear into the wings. It is a setting where the characters appear to expand in the new-found space, dreams are made and plans set in motion, and Butterworth’s accompanying dialogue is given room to grow and breathe. The play itself is concerned with very Mamet-like themes; primarily men, their sense of self understood by their status with their peers and with their work. They are men whose place in the word is uncertain, and reflect the uncertainty of Britain’s as it struggles to recover from the Second World War. Heads are being turned by the rise of America, and it is to this modernising capitalist vision, this land of opportunity, that their dreams of success are directed. Baby speaks reverentially about a Buick parked outside the club and rhapsodises about driving it across London in softened tones, almost in awe and unable to believe that such a car could exist in Soho. It is a light, almost dream-like moment, and one of the few moments in the play where Butterworth’s writing leaps out of the ordinary and suggests a talent for drawing heightened language out of the everyday; a skill that will later be put to more fertile use for Rooster Byron’s fevered monologues in Jerusalem. Potts (Daniel Mays), who, along with Sweets (Rupert Grint), forms a hapless duo at the core of the play, continues this theme with his personal mantra of the ‘fish is jumpin’ / And the cotton is high’ taken as a sign of the easy pickings across the Atlantic; the misunderstood misappropriation of Gershwin’s classic being a subtle signifier for the audience of how unobtainable the riches, and how alien the new world, for these characters. As a play there is little wrong with Mojo; there is nothing structurally problematic about it and is set in a deliberately dated time period and so avoids any problematic contemporary references. More importantly, in this age of director-led productions, this is almost defiantly an actor’s play and a West End producers dream. It is a classic ensemble production with five equally meaty parts to cast; each with their own moments to shine. It is perfect for drawing in a range of up and coming actors who want to hone their stage craft in relatively safe surroundings. Compare Daniel Radcliffe’s decision to choose Equuas as his first move away from the Potter universe, which was a very clear statement of intent, with Rupert Grint’s relatively sure-footed but understated debut as Sweets. His relationship-dynamic with Potts ins unlikely to be entirely unfamiliar to those who have soaked up Ron Weasley over the course of seven films, and brings with it a very healthy audience for the producer and another string to the bow of Grint. Daniel Mays’ Potts is the glue that binds this play together. An assured stage presence, and fresh from Nick Payne’s The Same Dark Water As Me at the Donmar, Mays is making a habit of effortlessly capturing the downtrodden, natural follower. His hangdog expression encapsulates those whose inner-lives are spent building elaborate schemes that are destined to remain in the mind. Potts is a man who dares to dream but never to act and, in keeping with high farce, comically incapable of making decisions even when they border the edge of tragedy. Ben Whishaw and Colin Morgan (Skinny) are given the most freedom with their characters, and it is their interactions that bring play alive. Whishaw, so disappointingly bland in Peter and Alice, brings to Baby an electrifying magnetism which is drawn out through a natural stillness in performance. This sense of outer calm can barely mask a maelstrom of underlying tension that is rarely far from the surface. It suggests an underlying sexual tension that makes his scenes with Skinny and Silver-haired Johnny crackle with energy. In the end the most striking thing about the revival of Mojo is how it now seems so conventional, and so naturally at home in the West End. It feels like the kind of play that could run and run, slowly swapping actors in and out of roles as TV and film schedules demand. This is not in itself a criticism as plays remain a rare sight in West End theatre, and revivals of plays written in the last 20 years far less so. If Mojo can go some way in helping to redress the balance then all credit to it. thanks for the note but did not understand what he says back to the academy.